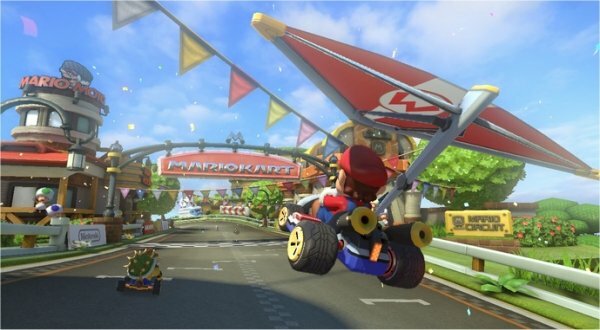 Mario Kart 8 finally released last week and early signs are pointing to the game being an early success as it flew off the shelves and managed to even bolster sales of the Wii U by a sound margin. It seems like a lot of the internet is ready to herald the return of Nintendo as an actual contender in the home console market, but I’m not yet convinced. Don’t get me wrong here; nothing would please me more than to see Nintendo right its course and steer its ship into less troubled waters. Competition breeds variety and creativity, something the video games industry could always use more of. But this single bright moment for the Wii U hasn’t yet convinced me to book my ticket on the hype train. For starters, it takes more than a single game to make a console and, as gamers have shown in the past year and a half, even Nintendo’s beloved stable of staple characters/franchises haven’t been enough to convert the masses. Folks went ga-ga for the original Wii, but something about the Wii U (likely a lack of third party support and a game pad many folks can’t come to grips with) has kept the console from capturing lighting in a bottle a second time. While I say “lack of third party support,” I suppose a more accurate comment would be “lack of much support at all, even from Nintendo.” Rather than churning out handfuls of new games that provide a valid argument for owning its new console, Nintendo has instead brought out a couple of titles a year, none of which have made that giant controller feel like a revolution in gaming. There’s even an attachment coming out to allow the Wii U to utilize GameCube controllers for games like Smash Bros., proving that the latest wacky idea from the Big N was more gimmick than innovation. And while the other (and quite a bit younger) next gen consoles are still finding they’re groove, at least their respective digital markets are churning out smaller and indie titles on the regular, giving folks something to sink their teeth into while waiting for the next big fix. When I see figures that show a jump of nearly 700 percent in Wii U sales following the release of Mario Kart 8, my first thought is, “Well, I would certainly hope so.” Considering how low sales were on a weekly basis to begin with, I’m curious to see if those kinds of figures will hold strong or if they will quickly putter back down to the regular abysmal levels. I can’t help but suspect this is the foreseeable future for Nintendo, considering its scant lineup through the rest of the year. I expect a small jump following the launch of Bayonetta, but I’m not sure even that game has enough “umph” to convince those who haven’t bought the console to finally take the plunge. We’ll see another big surge once Smash Bros. gets here this winter but, again, how long will said surge last? How many people are still waiting on a game like Smash to arrive who didn’t finally buy a Wii U once Mario Kart 8 released? As for Mario Kart 8 selling a bit over a million copies over the weekend, again, I’m not sure how excited I should be for those numbers. Those were worldwide sales and for, quite literally, the only show in town if you’re gaming on a Wii U. I would expect pretty much everyone who owns the console would have rushed out and bought Mario Kart 8 because, what else could they possibly be hoping to play anytime soon? Similar to the jump in console sales, I kind of expected to see bigger numbers than the ones that seem to have everyone else beating the Nintendo drum. I cannot, however, argue that this isn’t a positive sign for Nintendo and will hopefully give everyone the right kind of motivation to finally get this console rolling. I would love to see numbers like this on a regular basis, but Nintendo sure as hell don’t have the lineup to support it. I can only assume that Nintendo is hoping to use this flash in the pan to convince more developers to design games for their system, literally the only thing that could turn the Wii U into a legitimate success. Well, that, or they need to release major first party games on the regular and, from what I can tell, that simply isn’t happening.